If you haven’t heard about Skittles vodka, you’ve been missing out. There are a couple of different ways to make it. 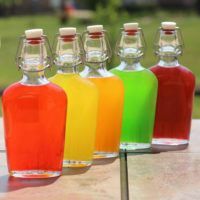 This recipe – or, really, it’s more of a method – takes you step by step through the process of making five flasks of Skittles vodka. Over the years since this was originally published, we’ve found better ways to do some of it. Most importantly, a better way to strain it. And we’ve tested it with rum, as requested by a lot of people who wrote in. In fact, the green one in this batch is rum. More on that at the end. Time to complete: 24 hours at most. That’s about 30 minutes of prep; 15 minutes altogether for the occasional shaking; a good 14 hours to just let it do its thing; and an hour or two for straining. 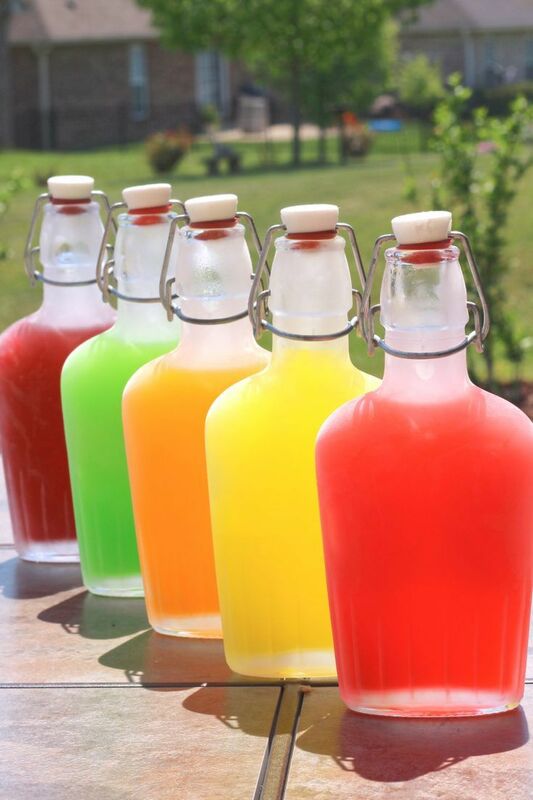 Need something quicker and easier than Skittles Vodka? Jolly Ranchers Vodka doesn’t need any straining or shaking, and infuses in about half the time. Note: you can also infuse vodka or rum with Starbursts. One 1 pound bag of Skittles. Or try Wild Berry Skittles, or Tropical Skittles. 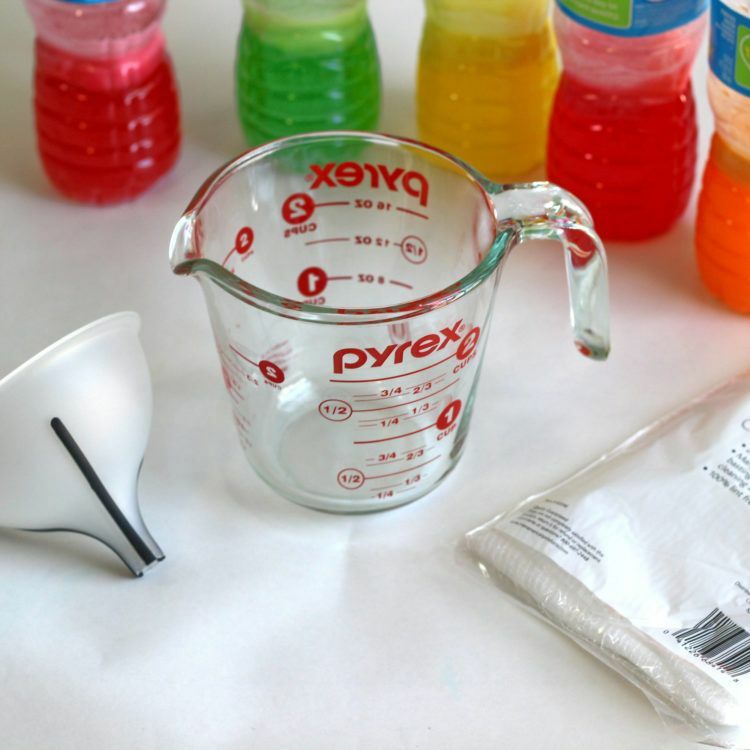 You’ll also probably want to cover your workspace with newspaper or freezer paper – the Skittles Vodka infusion can get messy. 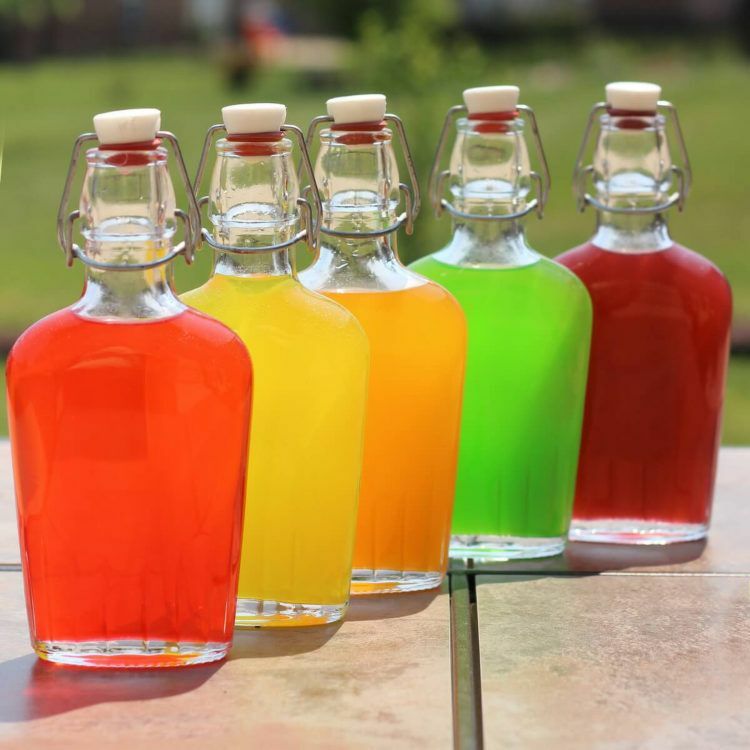 If you’re making a different sized batch, here’s the formula you need to know: I used 70 Skittles to 7 ounces of vodka, which yields about 7-8 ounces of infused vodka. If you want to make 1.5 times that, or 3 times that, just multiply your amounts. 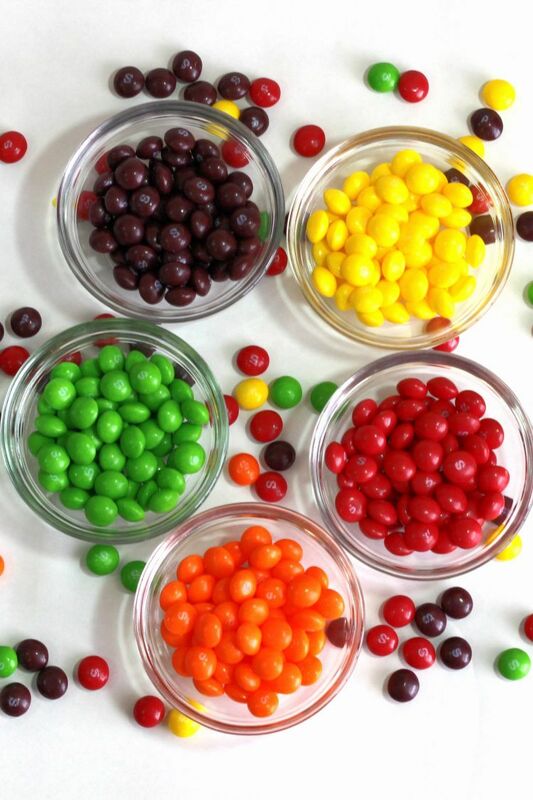 Start by simply separating the Skittles into flavors. You want 70 of each. 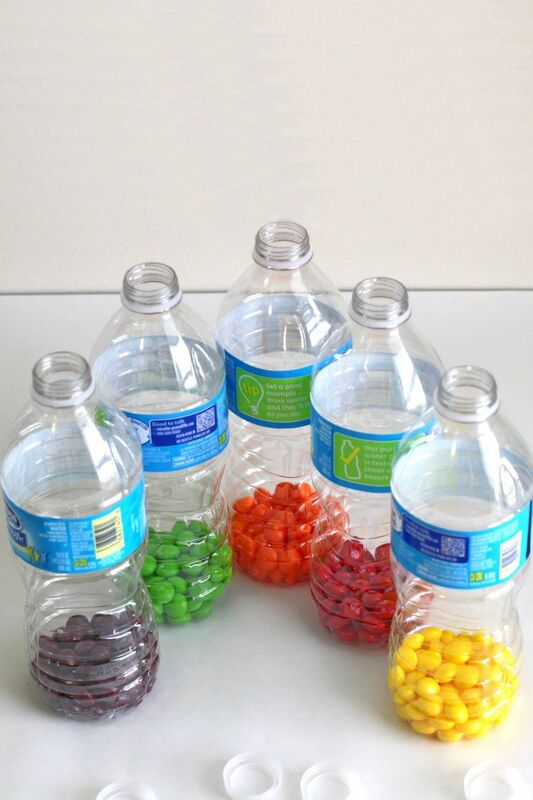 Now put your separated Skittles into 5 bottles, one flavor per bottle. You can use old water bottles, mason jars, thoroughly cleaned condiment jars, old vodka bottles – any container with a secure lid – plastic or glass. Mason jars work very well because they’re easy to wash out. And whatever bottle you use is going to get a lot of sticky gunk in the bottom that will need to be cleaned. Now add the 7 ounces (or whatever measurement you’re using) of vodka to each bottle. 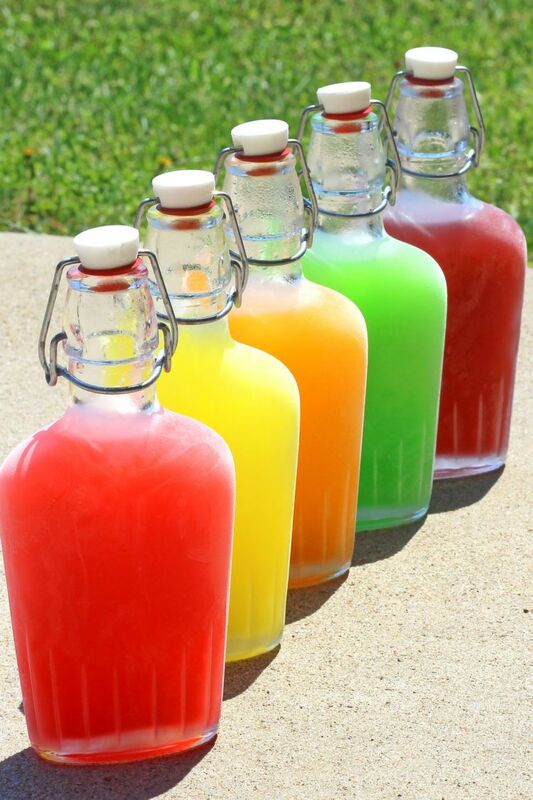 When this is done, all five bottles will have a pile of Skittles soaking in the vodka. 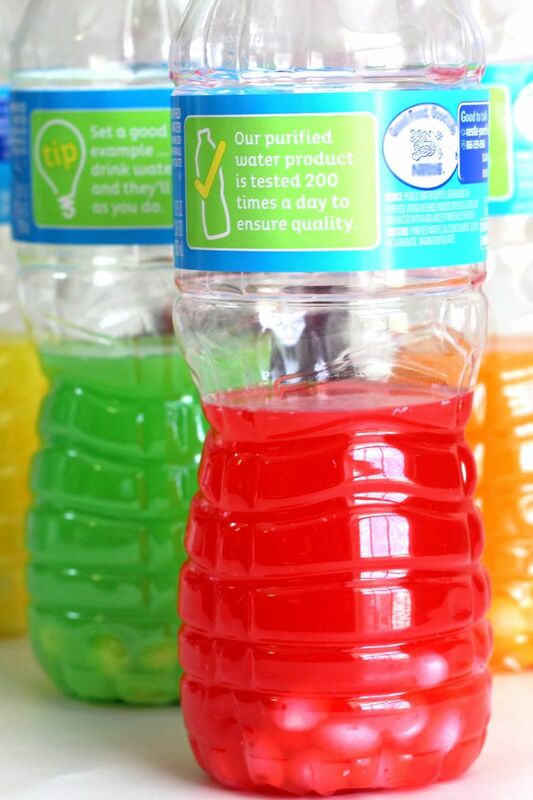 Now your infusion bottles all have Skittles in the bottom. Give each bottle a good shake – the more, the better. The candy coating will start to rub off and color the vodka, but the white insides of the Skittles still have a lot of dissolving to do. After shaking them, set them aside for a few hours. 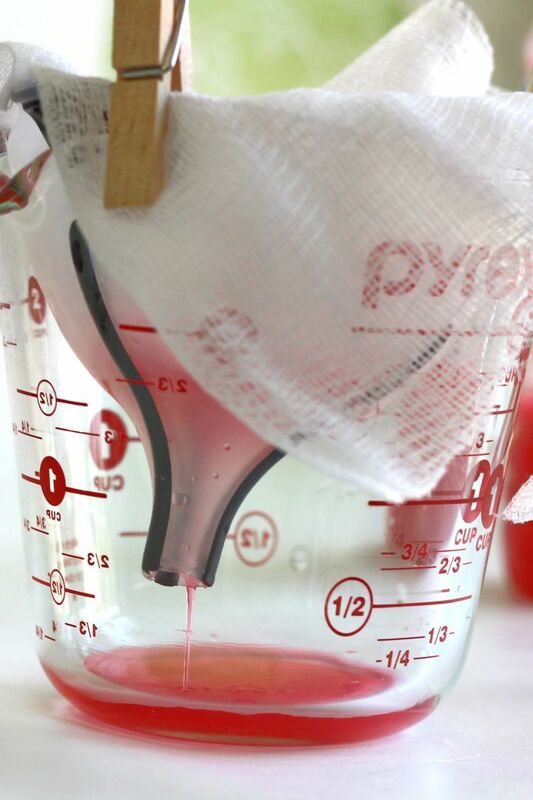 We found that shaking them every few hours, up to maybe 4 times altogether, helps them dissolve faster – especially if you’re making a bigger batch. These Skittles all dissolved overnight, but some people have had it take longer, so be sure to do this a full day in advance of when you want to serve them. See the white stuff at the bottom? That’s the gunk we’ve been talking about. 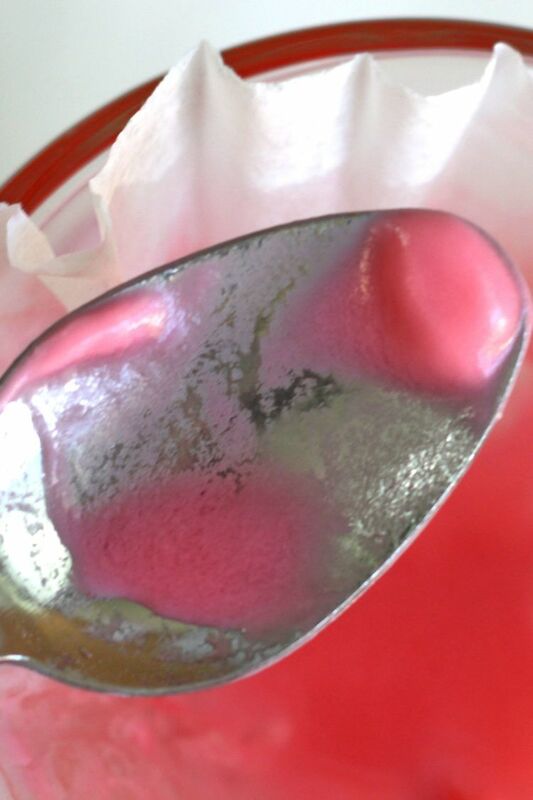 Once they’re all dissolved, you’ll notice a lot of layer of this white muck floating at the top of your Skittles Vodka. We’ll take care of this in Step 6. 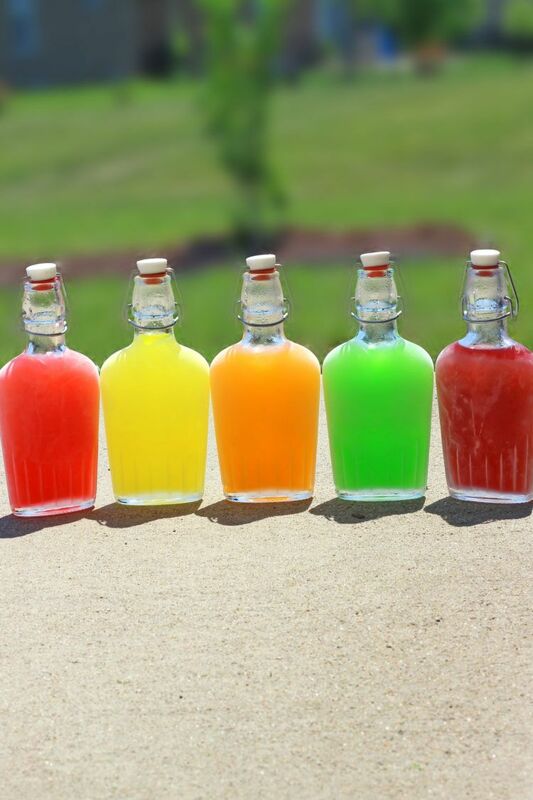 Skittles Vodka makes a great gift! And we’ve got more ideas for cocktail gifts, too. Through a lot of experimentation, we’ve found that the quickest and most thorough way to strain these is through 2 layers of cheese cloth inside a coffee filter. This combination of filters strained out everything in one pass, and didn’t take too long. But it might vary for you, depending on everything from the brand of coffee filters to the brand of vodka to how humid it is where you’re working. It’s hard to predict. If you want suggestions on how to arrange all the pieces of your filter, here’s what seems to work best. First, put the funnel inside the measuring cup. If you’re wondering why it needs a funnel at all, that’s because it directs the flow of the liquid toward the bottom, which seemed to speed up the whole process a little. Next put the coffee filter inside the funnel, and then the two layers of cheesecloth inside the coffee filters. Then pour one of the infusions into your strainer setup. You may find you can only pour a portion of it, and then wait for some of it to soak through, then pour another quarter in, and so on until you’re done. 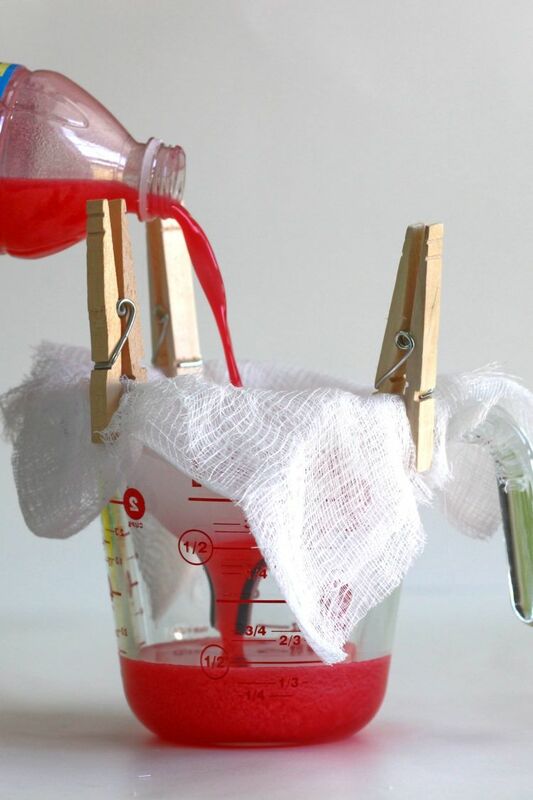 If after a while you find the cheesecloth and coffee filter keep sinking down into the filter, you can use clothespins or sturdy plastic clamp clips to hold it all in place. Looks kind of bizarre, but it works. 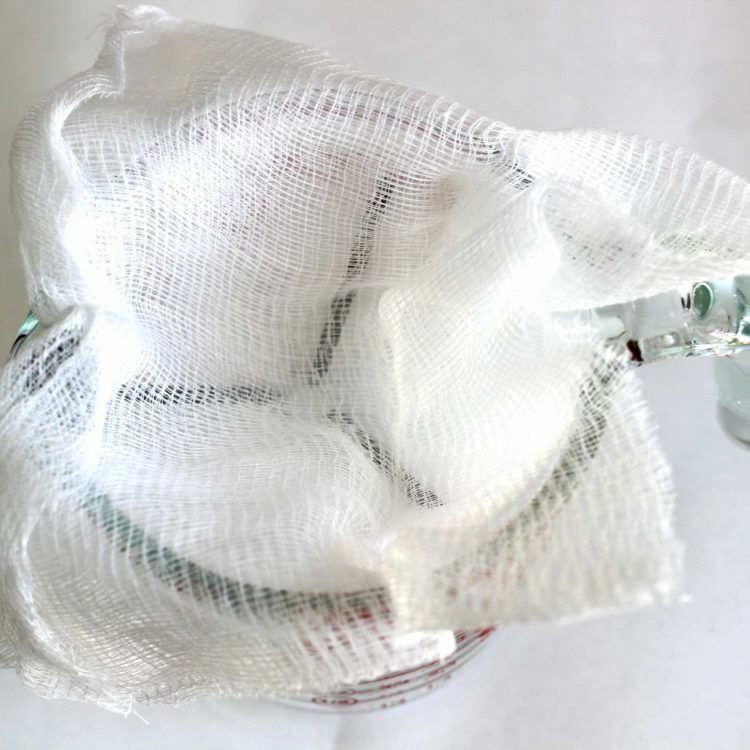 If the strainer clogs with white gunk, you can use a spoon to scrape the gunk out of the way. In the end, you’ll have about 8 ounces of Skittles Vodka. The coffee filters and cheesecloth will be soaking wet, so you may want to dump them into a bowl to carry over to the sink. 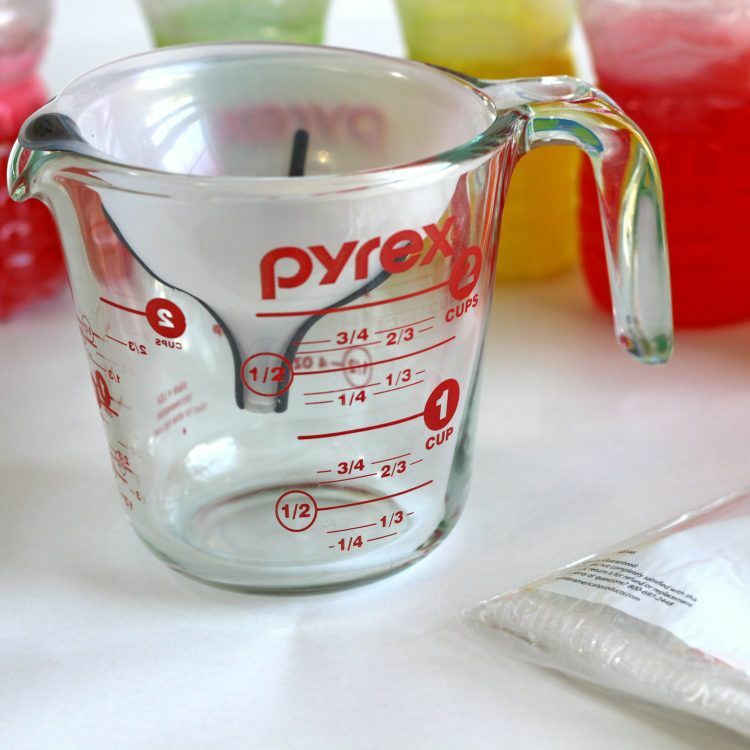 Now you’re ready to pour the liquid from the measuring cup into a flask. Repeat this process for each flavor. Mix them with fruit juice. Spike beer with them. A good pale ale will taste great with most Skittles flavors. Everyone’s taste varies – there are so many directions you can take this drink in, you really should try anything that sounds good to you! How long will this keep? We’re not scientists, but we have kept these for about a month with no problem. Strangely, the purple color can fade to pink, but that was the only “issue”. Everything tasted just like it always does and no one got ill. To be on the safe side, you should make these no more than 2 weeks ahead. Can you do it with rum? Absolutely! The green one in this batch is rum – it takes the same amount of time, strains the same way, etc. But the rum will add its own flavor. If you’ve ever had rum balls or butter rum candy, that’s the flavor it adds, and it’s delicious. The rum is actually really tasty. Both ways are terrific. Can you strain it with [insert alternative here]? You can strain it with many methods, but the one outlined here is the one we’ve found to be the quickest without letting through gunk and needing a second pass. Vodka infused with Skittles candies tastes exactly like the candies, but with a kick. It's a fun, delicious way for people of legal drinking age to enjoy a childhood treat in a grown-up way. Put 60 in each 8-oz flask, and fill with vodka. Shake periodically for a day or two. Strain out the white gunk at the top, and serve. can you use flavored vodkas like orange or raspberry flavored vodkas to achieve this? 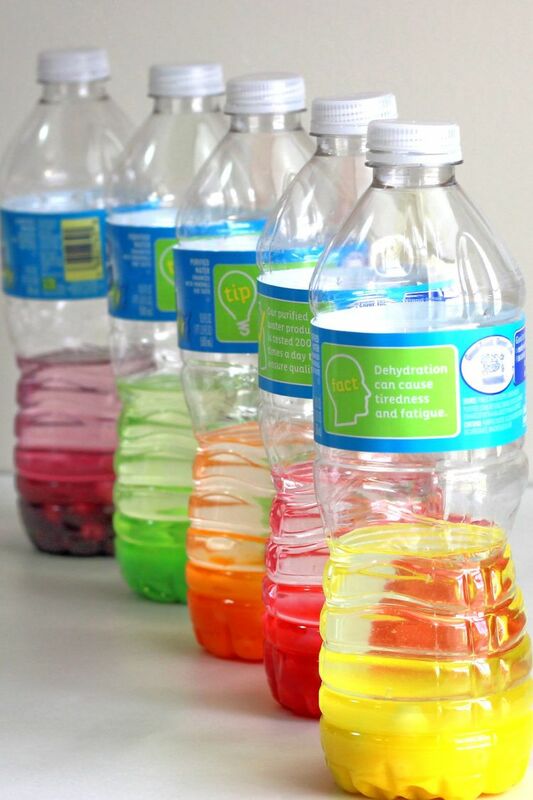 When I put the skittles in the water bottle with vodka to dissolve. Do I put it in the refrigerator or freezer to sit while it dissolves? Or can I just leave it out on the counter? It’s 10 Skittles to 1 ounce, and 70cl is almost 24 ounces. So, 235 or 240 should work. I tried a fancy rum once, and it didn’t work so well. I like plain old Bacardi light rum. I made these for a graduation party last year and the kids loved them. That’s a legal question I can’t answer. Check with your local licensing authorities. I bought a few giant bags of skittles and boiled down the skittles back into a syrup then used it as a Daiquiri or margarita syrup. Then you just blend it with ice and your chosen alcohol and it’s delicious. 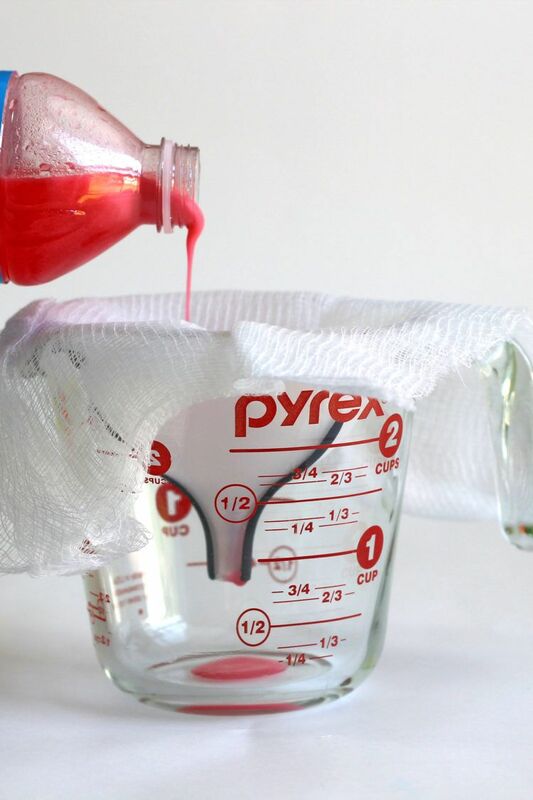 When you boil the skittles use as little water as you can to preserve skittles flavour. Oh, you are brilliant! Skittles syrup! Do you mind if I write that up as a recipe? I’ll credit you! Yep – take a look at my Candy Corn Moonshine infusion. It’ll work pretty much the same way. My question is not about the recipe but your beautiful bottles in your pic. I fell in love at 1st site. If I may be bold enough to ask where on Earth did you find them. Amazon – click here for them! You can also buy them individually. if i want to use rum, what’s a good rum to use? Bacardi White is the best I’ve tried. I tried more expensive ones and it just wasn’t so great. Hot Tip: If you use custom tea bags and put the skittles in them, the straining part takes 5 seconds. Holy! Are you serious??? I’m totally going to try that next time! Thanks for the tip!